Joe Haden will miss the Browns' season finale vs. Pittsburgh due to a hip pointer injury. 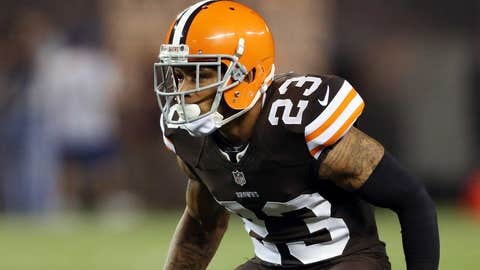 PITTSBURGH (AP) — The Cleveland Browns have made Pro Bowl cornerback Joe Haden inactive for Sunday’s season finale against Pittsburgh due to injury. Haden is dealing with a hip pointer. He will be replaced by rookie Leon McFadden. Cleveland nose tackle Phil Taylor is out with a concussion and starting defensive end John Hughes is out with a knee injury. QB Alex Tanney, OL Jason Pinkston, OL Shawn Lauvao and TE Andre Smith are also out for the Browns. Tight end Jordan Cameron, who left last week’s loss to the New York Jets, will play for Cleveland. Pittsburgh outside linebacker Jason Worilds, who leads the Steelers with seven sacks, is out with an abdominal injury. WR Emmanuel Sanders, who missed practice all week, will play despite a knee injury.